We had heard of the garden at Rémalard called la Petite Rochelle before, but only came to visit it for the first time after chatting with the owner of the gardens at Château de Lorière which is nearby. 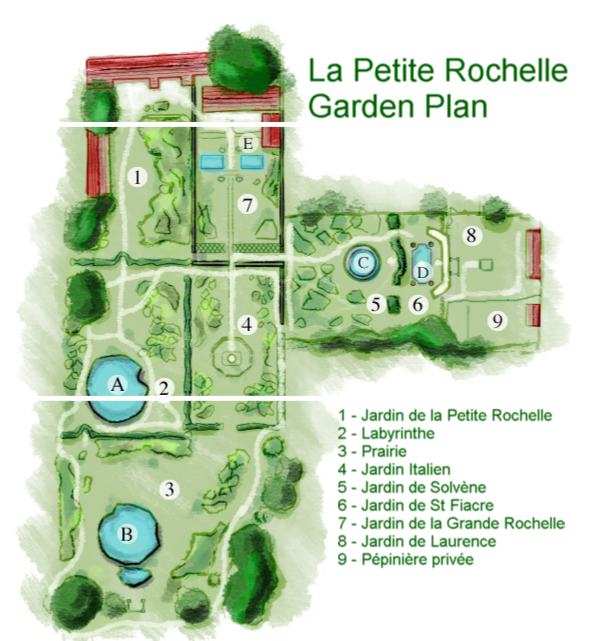 In fact there are 4 gardens in close proximity, the other two being Manoir de Pontgirard and Jardin François. The owner of Lorière was quite insistent that we just had to see la Petite Rochelle – and time was of the essence as it would only be open for another week, its season ending mid-August. La Petite Rochelle won the “Parc des Parcs” prize in 2006 – a good sign – and unlike most “private” gardens it opens every day of the week in season. This meant we could visit it the very next day. The entrance to la Petite Rochelle (22 rue du Prieuré, Rémalard) is not obvious and we were past it before we realised it – just a gap in the wall that runs the length of the street, with only a tiny sign to indicate you’ve arrived. But once inside a magical garden appears as if by magic – the wall keeps its secret well hidden! The garden at La Petite Rochelle is very “English” in style, informal rather than regimented and with good plant combinations – the garden includes national collections of daphne and pieris but you don’t need to be a botanist to appreciate it. It is broadly divided into eight parts that were developed in stages between 1976 and the present day by the owner, Helene d’Andlau (cousin of Peter Wolkonsky, creator of the Jardin de Kerdalo) and her daughters, who will be happy to tell you the history of the garden. Opening times are fairly restricted but it is so exceptional that we strongly recommend a visit if you are lucky enough to be in the region at the right time of year. It took us about 1 to 1.5 hours to explore the garden; it is not huge (about a hectare in all) but it twists and turns with many interesting features (like the fountain and statue to Saint Fiacre, patron saint of gardeners), and it is liberally peppered with seats that invite you to take a pause at regular intervals. Take advantage of them and don’t rush it! Open one weekend per month in April, May and June. Open every day during the main French holiday period mid July to mid August BUT NB Afternoons only, 13h00 to 19h00. Entry for adults was 3€ in 2010. If you’re loking for accommodation in the Perche, the route shown is from our B&B on the border of Normandy and Pays de la Loire. We are about 45 minutes away from Rémelard and Petite Rochelle by car. You two do get around! We saw this garden on the Journees du Patrimoine a few years ago and it was so packed with people it was hard to appreciate. Your gorgeous video has encouraged us to go back. I didn’t know about the link with Kerdalo–another garden I’d like to visit.